My hunch, my hunch, my lovely casey hunch! Charles: "My hunch, my hunch, my lovely casey hunch!" Sing with me. Jake: That's not gonna happen, I will literally never -- "What you gonna do with all that hunch, all that hunch inside your brain!" Charles and Jake: "We're gonna solve, solve, solve this case, solve this case right in your face!" 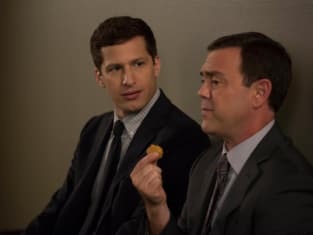 Brooklyn Nine-Nine Season 3 Episode 3: "Boyle's Hunch"
Permalink: My hunch, my hunch, my lovely casey hunch! It's horrifying from everywhere. Terry hates creepy crawlies. Permalink: It's horrifying from everywhere. Terry hates creepy crawlies.